Plant Protein. Connect with The Earth Meditation. You must have been eating lots of wonderful greens and vegetables! If so, you have been consuming plant protein. I hope you stayed away at least somewhat from meats, dairy and other animal foods. This week we will focus on adding even more plant protein to your meals – from legumes, grains, vegetables and fruits. And get ready for some numbers. Longevity experts, specifically Valter Longo, the author of The Longevity Diet book (a great one to read), recommend that we eat 0.36 grams of protein per pound of body weight per day. That is protein, not food that contains protein. For example, 50 grams of garbanzo beans contain 5 grams of protein. Thus, a person who weighs 140 pounds should eat 50.4 grams of protein per day, 150 pounds – 54 grams, 160 pounds – 57.6 grams and 175 pounds – 63 grams. This is in line with the World Health Organization’s daily protein recommendation. How much protein do plants contain? 25% of the calories in your average vegetable come from protein – with many leafy green vegetables boasting as much as 50%. An average bean contains 25% protein. An average whole grain contains 12%, and quinoa as much as 18%. An average fruit contains over 5% protein, with lemons as much as 15%. The source is Plant Strong by Rip Esselstyn, a great book. Here is how you can roughly assess the protein content in foods. Consider breakfast: you can get 15 grams of protein from 1 whole apple or 3-4 eggs; 1 serving of yogurt contains 5 grams, and 1 slice of turkey bacon – 4-5 grams. Consider lunch and dinner now. 4 oz of chicken, a piece that is a size of a deck of cards, contains 20 grams of protein, 3 oz of salmon – 18 grams. 1 cup of black beans contains 10 grams of protein and 5 grams of fiber. You will get about 25 grams of protein from a small slice of meat or 4 eggs or 1 cup of lentils or 1 2/3 cups of black beans or 3 cups of quinoa. Animal foods contain no fiber – big problem! Now lets look at some grains. Cooked brown rice contains 5 grams of protein and 4 grams of fiber per cup, wild rice – 24 grams of protein and 3 grams of fiber, and basmati rice – 8 grams of protein and 2 grams of fiber. The protein content per 1 cup of cooked buckwheat is 20 grams, oats – 10 grams, millet 6 grams and quinoa – 8 grams (the fiber content for these grains are 4.5 grams, 4 grams, 2.3 grams and 5 grams, respectively, per 1 cup). As you can see, it is very easy to reach your recommended protein consumption by combining legumes, whole grains and vegetables, especially the green leafy ones, and chasing them down with some home-made lemonade (just peal the lemons and blend them with water, or better zest it first and use the lemon zest in other dishes). Plus, you will be eating foods that are good sources of fiber. The American Heart Association Eating Plan suggests that total dietary fiber intake should be 25-30 grams per day from food, not supplements. Currently, dietary fiber intakes among adults in the United States average about 15 grams per day. On a plant-based paradigm you will be getting the fiber your body needs. Now that we are adding so many food items to our repertoire, we shall wear a chef’s hat and get excited about “gastronomic design” – assess our plans for a month, week, day, meal and each plate as we want variety in color, flavor, consistency, method, presentation, etc. And we want to achieve this with grace and simplicity. When you go shopping for groceries, focus on loading up on lots of produce that keeps in the fridge and on the counter for a while – at least for several days, e.g. root and cruciferous vegetables, apples, oranges, pears. Always keep in the refrigerator onions, garlic and ginger. Also buy as much vegetables, fruits and herbs that you know you like and will use before your next trip to the market. Always keep your favorite berries, fruit, vegetables and beans in the freezer. Some vegetables are not suitable to freeze, like raw potatoes, and some are not as good after being frozen, like onions or carrots, in my opinion. Choose per your taste preferences. In your pantry, store plenty of dried and canned (no salt added) beans, lentils, whole grains and healthy pastas (made out of whole grains and legumes). The spice shelf in your pantry is of a huge importance. You should have sea salt, various peppers, and dried spices and herbs. For the latter, it is a good idea to keep as many ethnic collections as possible – Mediterranean, Middle Eastern, Japanese, Chinese, Indian, Mexican, Russian, Ethiopian – these can be single herb or blends (be careful to exclude the blends with ingredients that do not come from Nature as well as those with excess salt and any sugar). A generous sprinkle of fresh or dried herbs can easily double the anti-oxidant value of your meals. Cinnamon, cardamom and vanilla bean add another dimension to your smoothies. Good mustards (Dijon, whole seed) and a variety of vinegars (balsamic, rice, wine, apple cider, infused) is a must. Eating with the season is what humans have done for centuries… until recently. Eating with the season will keep you in energetic balance and harmony with Nature: roots and beans warm you up in the winter, young greens detox you in the spring, fruits and melons cool you in the summer, and the abundancy of the autumn harvest will transition and prepare you for the winter. Eating with season will insure you are getting the freshest produce that was harvested at the optimal time and hopefully locally. Traditionally, all cultures based their medicine and healing practices on seasonal plant harvesting and eating, be it Chinese, Indian, Japanese or Russian. So, consider that when you plan. Focus on choosing correctly for yourself and your loved ones when you grocery shop, cook and eat! What are you getting too much of? What are you getting not enough of? Michael Greger has a smart phone app called the Daily Dozen that is based on whole-food plant based nutrition with a goal of maximizing the intake of healthy foods. 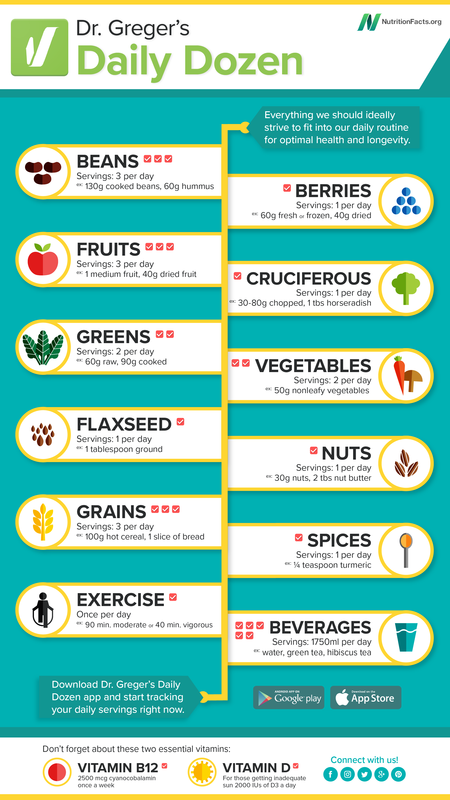 Check it out and use it when you allocate your caloric budget to food choices. You can view it HERE. Whole-food plant based approach to eating is the only “diet” that is supported by scientific evidence as to prevent and potentially reverse many widespread diseases. One cannot go wrong with scientific evidence as opposed to opinions, beliefs, commercials and other ways that we are confused with about food. During Week 1 our mantra was focused of choosing vegetables as the main source of food – “I eat lots of whole plants. Every day I eat vegetables and greens. I maximize my nutrient intake, health and vitality.” This week, these messages are still and always relevant but we also would like to be more specific about our efforts during Week 2: “Plants are a great source of protein, fiber and other nutrients. Plants are delicious and versatile. I am a good plant-based chef.” Visualize the fruits, vegetables, herbs, beans, grains that are your favorite, and see yourself creating some amazing, vibrant, colorful, healthful, full-of-flavor dishes with these plant foods. Praise yourself for cooking and eating this food and for feeding it to your loved ones. We will continue with the habits from Week 1 and will adopt two new habits during Week 2: (1) in addition to breathing abdominally, we will learn and begin to practice a grounding qigong meditation that helps us learn how to connect with the Earth, and (2) we will make an effort to creating daily balanced plant-based meals that contain greens, legumes and whole grains. Every day at least once, these ingredients should be a part of your meal. It does not have to be the same meal. For example, I can have oats with fruit or greens for breakfast or lunch, and then have baked sweet potato and cauliflower with rice and beans for dinner. Otherwise, I can have a vegetable soup with lentils or beans for breakfast or lunch, and then have pasta and a big salad with lettuce, green beans and mushrooms for dinner. I am not providing specific recipes this week, but you are always welcome to contact me if you need suggestions. Cue: Use the card(s) that you made last week. Near the green leaf, please, add a small brown circle that corresponds to whole grains and an oval that corresponds to beans, as you will be adding these foods to your daily intake. If you didn’t get to eat, let’s say, beans on one day, just make sure you add them the next day – don’t have to be perfect, but have to be good! In addition, draw a little picture of a cooking pot or a spoon to represent your commitment to be your own chef, a plant-based chef that is. If you need a new cooking apron, this a good opportunity to buy one and call it “my commitment to eating plants” apron – that would be a great cue. Routine: Your routine has three components: (1) when, grocery shopping, choose the right ingredients that compose a balanced plant-based meal; (2) plan what you want to eat in the next few days and have the ingredients ready and prepped so that you are not overwhelmed before each meal – take the thinking out of the equation as much as you can; and (3) print out or write down (you can read it to yourself into your smart phone) the grounding meditation below and practice it every day or when you can. As always, you should repeat the Mantra for the week and do your visualizations of success at your efforts every time you think about your new goals. If you do not know what to cook from the top of your head, select several recipes from websites like engine2diet.com and/or forksoverknives.com and start there. Reward: On this path, some days are easier than others, but overtime, you will start feeling better and having more energy. If a sluggish day occur or you give in to a weakness, like a craving for example, or you feel tired, be kind to yourself – there are lessons for us hidden in everything. Remind yourself why you are making these changes and setting new goals, and focus on how proud you are of your commitment. One step at a time, you are making progress. The sense of satisfaction will arise every time you notice the benefits of your new behavior. Here are the words of wisdom from Aristotle: “We are what we repeatedly do. Excellence, then is not an act but a habit.” Visualize yourself having achieved your goals – vibrancy, health, energy, lean body, ease of movements, high vibration, happiness and so on. Be specific with your images. Plus, give yourself a special reward: think of something that is really interesting and exciting to do, or something that you have not done before, and do it. It can be anything that is new and fun to you – a hobby, a class, a sport, a concert, a trip, a reunion with friends, a special present, a party, etc. This is a simplified part of a longer qigong meditation. Find a quiet place and time for this meditation. If you are familiar with standing meditation, it is preferred that you stand with feet firmly placed outside the shoulders, erect and stretched spine, knees microscopically bent, and arms relaxed but “aware” by your sides. If you have never done standing meditation, it is acceptable that you sit down. Begin with abdominal breathing and relax into it. Preferably, your eyes should be gently closed (if you need to keep them open, make sure that they are barely open and very relaxed). This meditation is used to dissolve stress, let go off busy senses and thoughts, relax, sink, root your mind, extend your energetic fields into the Earth, and allow the energy of the Earth to penetrate your body. Imagine and feel a gentle wave of relaxation moving down the front of your body from your head down to your feet and deep into the Earth. Next, imagine and feel a second wave of relaxation moving down the back of your body taking away any tension and stress into the Earth. The third wave of relaxation flows down the sides of your body and through your core center into the Earth dissolving any stress, tension, thoughts and emotions as you are becoming relaxed, clam and peaceful. Feel your feet deeply planted into the Earth connecting you with the planet. Direct the flow of your energy into the Earth. Breathe into the souls of your feet and feel the presence of the Earth’s energy. Imagine and feel your energy connecting with the Earth’s energy. See yourself as one with the Earth. Earth always provides us with unconditional support and nourishment. Thank the Earth for that. Keep your feet firmly planted into the Earth. Imagine yourself being a tree. Drop your roots into the Earth. With each breath, grow your roots deep into the Earth in all directions – front and back, right and left, and deep-deep down towards the Earth’s core and past the core. Be patient, allow your roots go grow deep. Once your roots are as deep as they can be, invite and allow the Earth’s energy to start traveling up your root system. See the golden color of the Earth’s energy. With each breath, guide this energy up closer and closer towards you, then into your feet and up your legs. As the movement of the Earth’s energy gains momentum, it rushes up your legs and pours into your lower belly. As you breathe, allow the Earth’s energy to continuously flow into your lower belly, filling it up and circling in all directions, creating an energy ball size of a basketball. Once you have created the energy ball, condense it gradually to a smaller and smaller size until it is a size of a bright pearl. Leave this energy pearl in your lower belly. It is now stored there and available for you to access it at any time. Bring your awareness back into the room and open your eyes. Enjoy! Eat lots of plants and practice your connection with the Earth regularly. Have a wonderful week and come back for Week 3 suggestions!